A DUI not involving injury or death to another person is a misdemeanor offense in California. Misdemeanors are generally thought of as low-level offenses that carry low punishments. This, however, is not generally the case with DUI misdemeanors. People who have experienced a first-offense DUI will tell you how emotionally, financially, and professionally draining the DUI process can be. Our society adds an additional negative connotation to DUI offenders, which has been reflected in the increased penalties set forth by the Legislature. There are many steps and obstacles that must be navigated from the beginning of a DUI case and continuing past the judgment phase. Too often, attorneys with little experience in the DUI process miss critical steps that create unnecessary burdens and negative results for their clients. If you, or someone you know, has been charged with DUI, it is extremely important to hire an attorney with the experience and knowledge to properly handle the case. Another complex factor surrounding DUIs is the DMV. The DMV aspect of a DUI case is separate from the criminal case; it is a civil, administrative entity that has a completely different set of legal standards that must be met and addressed. These days, many people facing DUI charges face increased personal obstacles based on the DMV’s determinations, because more and more employers have increased their scrutiny of employee driving records. 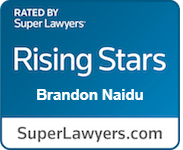 The Law Office of Brandon S. Naidu has extensive experience navigating the complexities of DUI laws and the DMV. Our promise to our clients is to ensure that their case is handled thoroughly and properly. Call (619) 363-4811 for a case evaluation.